Getting a massage used to involve going to see a masseuse and having to pay the price for a professional service. Today, there is a method that allows you to pay one time, and you can use this method over and over again from the convenience of your own home. You can have all this by getting your own electric seat massager. You don’t have to get an expensive, bulky massage chair to get more of the stress-relieving massages you crave. Instead, these portable seat cushions and chair pads can be used with any chair that you already own. You can keep it at your office desk for quick massage breaks when you need them, or pull it out before bed to help you relax. These massagers are affordable and easy to use, and there’s a wide selection available on the market today. If you need a way to relieve stress or if you struggle with muscle tightness or pain, then keep reading. In this article, we’ll take a look at how these massagers work and what to look for in a massage cushion or chair pad. So How Do These Massagers Work? 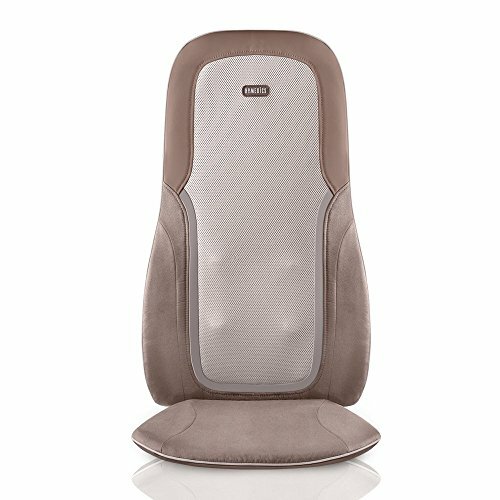 A massage seat cushion or chair pad gives you the benefit of a massage chair at just a fraction of the cost and space. Note that in this article we are looking at both chair pads and pillows which are different. A chair pad works by being placed, or in most cases strapped on to your chair and then plugged it into an outlet. This is the main difference between a massage chair or recliner, which have the massage mechanisms built into the chair. A massage pillow is exactly what it sounds like. You guessed it, it’s a pillow with a built-in massager. Most cushions and pads offer various settings for different massage actions and they tend to target your upper, mid and lower back and buttocks. How can these cushions or pads turn your health around? First of all, they boost blood circulation, which provides a host of benefits by delivering more oxygen and nutrients to your brain and vital organs. It improves brain function and focus, making these massagers particularly helpful at your work desk. By targeting specific muscles with different kinds of strokes, these massagers can relieve muscle pain and tension. If you have one tight, painful muscle in your back, the other muscles tend to take on stress in order to compensate for it. The benefit of these massagers is that they can massage your entire back at once. This massage experience helps reduce stress while releasing endorphins, known as your “feel good” hormones. Stress relief is linked to better health, and it can help you get better quality sleep. The relaxation a massage cushion or pad brings you makes it incredibly useful for anyone who deals with stress on a day to day basis. It’s also helpful for people with chronic back pain, athletes and anyone who does intense workouts. All you need to do is sit; there’s no action on your part needed that would require you to use other muscles. You can simply let your entire body relax. There’s a wide variety of massagers on the market, and there are several differences that may stand out to your specific needs. Heat helps loosen muscles, and heating pads have long been used to alleviate muscle tension and back pain. Some massage cushions combine the benefit of heating with the massage by serving as heating pads at the same time. Some can give you the option of heat only, while others only heat while massaging. 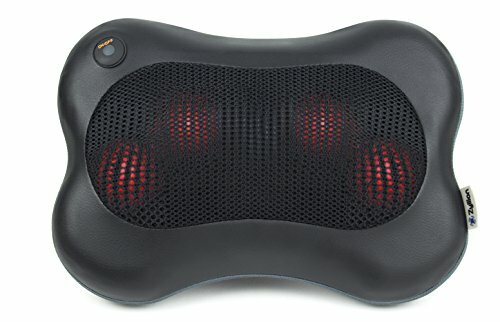 If you choose a massage cushion with a heat feature, look for one that protects against overheating by shutting off automatically on a timer. You may prefer a heat massager that gives you temperature control as opposed to a simple “on-off” heat feature. Where you’re going to use your massager is something key to consider. Massage seat cushions and chair pads are designed to be used on any chair. However, some are more portable than others. Consider whether you need something that’s cordless or easy to take to an office every day. For maximum portability and the most compact size, you’ll want to go with a massage pillow, which is a small massager designed to work on small areas at a time. If having a full back or full body massage experience is more important to you, then you’ll need to look for something larger, that extends the length of your back and even massages your hips and thighs. Different massage cushions attempt to mimic different styles of massage therapy. A popular form of massage is Shiatsu, which involves applying pressure, rolling and kneading using thumbs, hands, elbows and even feet to release muscle tension. Many massage cushions emulate this style through the use of balls called nodes, which roll around inside the cushion. Other massagers work by providing a vibration or percussion action that loosens muscles through repeated pressure. It can take time to find a chair pad or pillow that works for you. Everyone has different bodies which have different massage needs. You may not find the right chair massager on your first go so it is a good idea to have an option to return it in such a case. Now that you know what you’re looking for we’ll now take a look at the top 7 cushions and chair pads. The HoMedics Quad Shiatsu is designed to fit on any chair or couch without the need to strap it on. 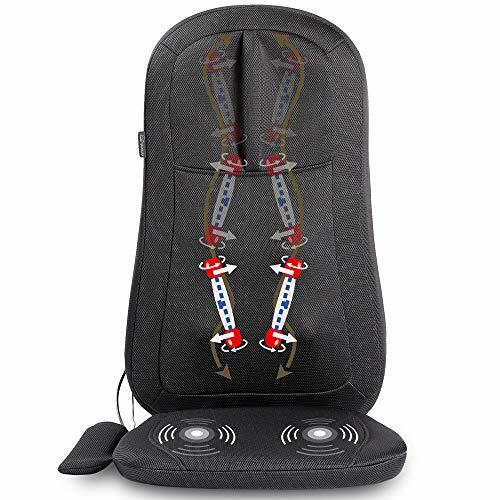 With this seat cushion massager, you get 3 different massage styles: kneading, percussion and targeted spot massage. Kneading is the generic massage style, which many users complain is painful without extra padding. If that’s the case for you, you may prefer the percussion style massage option of the HoMedics massager, which taps the back almost like a vibration, loosening your muscles without pressing as hard as the kneading function. The targeted spot massage style gives you a localised massage and can be effective in working out muscle knots. In sum, this massager has the potential to work well for you, but it’s a good idea to try it out first at a store or make sure you save the box in case you need to return it because it could be too intense for you. This small massage pillow only works on a small area, but with its adjustable straps, you can attach it to any part of a chair to target your upper, mid or lower back, or your neck. You can also place it on your thighs, calves or abdomen. While it doesn’t grant the benefit of massaging a large area at once like a full-back massager would, it does give you the versatility of placing it on different muscles around your body so that you can customize your experience based on your needs and your size. It’s designed to give you the option for use in the car, and its compact size makes it easily portable. While it does provide a heating feature to help loosen muscles, it only offers one massage style, with its 4 deep-kneading Shiatsu massage nodes. This chair massager is different from the other products on this list as it is a full foldable chair with the massage pad built in. This massage chair is light and compact compared to high-priced bulkier models, so you can move it around your home to different rooms, or store it when you’re not using it. It has 8 massage nodes that can heat according to your setting, which you control with the panel on the armrest. There are 2 nodes at the neck and 6 nodes for your back, which roll and knead to provide a full back-and-neck massage. It can recline, which takes pressure off your spine by supporting your back. 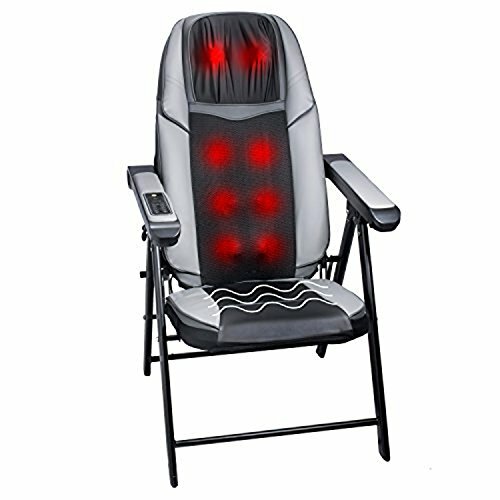 If you don’t have a reclining chair at home where you can place a massage cushion, this reclining massage chair is an affordable option. 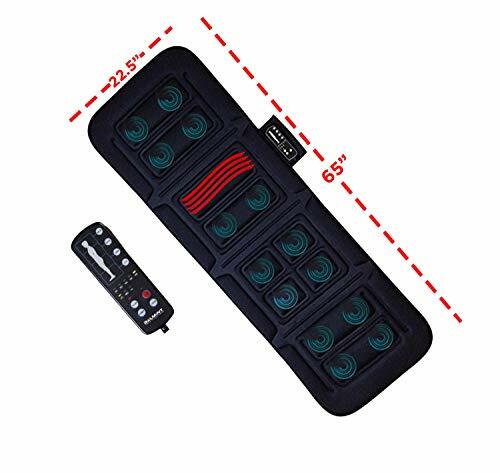 Whereas many people find other massage cushions too hard on their muscles, this one lets you choose between a higher or lower intensity, as it comes with a pad you can attach over the cushion to make it softer. The Snailax Shiatsu massage seat cushion targets your neck, shoulders and back, and it gives you the option to target one area at a time. There’s also an option for heat, as well as seat vibration at 3 different intensity levels. While it fits well on most chairs and sofas, the neck massage feature may not reach neck level for taller individuals. However, if the cushion does not fit you, it offers a full back and neck massage, giving you a fuller experience for better relaxation. 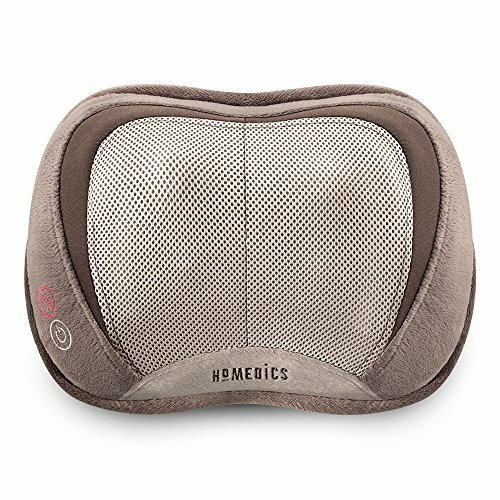 This massage pillow from HoMedics is similar to the Zyllion Shiatsu pillow, as it also features heating and a deep kneading Shiatsu style massage with rollers. However, the HoMedics gives you more versatility of use for a few different reasons. First of all, it has a vibration feature, whereas the Zyllion pillow doesn’t vibrate. With the Zyllion pillow, you can only use heating while the rollers are massaging, but with the HoMedics pillow you can use it just as a heating pad. Every feature can be used on its own or in any combination. For example, you could use heating and vibration, vibration alone, or massage and vibration. The HoMedics pillow even costs less, making it a no-brainer when stacked against the Zyllion pillow. The only reason you might choose the Zyllion pillow was if you really wanted to be able to strap it to a chair or use it in your car, as the HoMedics pillow doesn’t come with a strap or car adapter. One disadvantage could be that the rollers only massage at a 7-inch width, which isn’t suitable for massaging shoulders, trapezius and other areas that span widely. However, this pillow is great if you’re looking for something for office use, because you can loosen your muscles and improve circulation with just the heating if you want a noise-free experience. If you want the complete full body massage experience at an affordable price, this massage mat is the way to go. It’s equipped with 10 massage motors, and it folds in 3 places, allowing you to sit or lay down at any recline. This is what separates it from the other massagers on the list. If you want you can lay down instead of sit, which takes pressure off your spine and helps blood flow to your head unlike the seated massagers. This mat is highly portable but offers the full body experience at the same time, which is a combination hard to come by. Its thin design allows it to fit almost undetected on office desk chairs. You can choose to have your whole body massaged at once, or focus on one spot at a time. You can control the experience from a handheld device, which allows you to change between 5 different pre-programmed massage modes, 4 different zones and even adjust the intensity level of your massage. When it comes to getting a full body relaxation experience to relieve stress, the Belmint full body massager is the way to go. However, if you have muscle knots and need it for therapeutic use, you won’t get the deep tissue massage that you get with a Shiatsu massager. The cordless Shiatsu massage cushion from Snailax provides heating and Shiatsu massaging with 10 small nodes for deep tissue kneading. You can use it without being attached to a power source, as it can provide 70 minutes worth of massaging before it needs charging. This eliminates the hassle of using extension cords when the nearest outlet is too far, and you can use it during a road trip or even on an aeroplane. 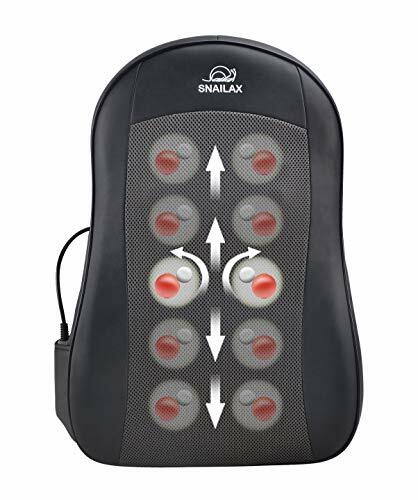 Unlike the SL261 Shiatsu massage cushion also from Snailax, it doesn’t have a vibrating seat. However, it gives you a more complete back massage compared to the SL261 model, because it has 10 massage nodes that roll and knead your muscles, instead of just 4. Because it has no seat, you can also use it on other parts of your body that need relief. For example, you can lay your legs on it to use it on your thighs and calves. Another way this model compares to the other Snailax Shiatsu massager is that they both offer an attachable pad that lowers the intensity of kneading. This massager is a good option if you need a therapeutic, deep tissue massage without the need for an outlet and cord. Which is the Best Overall Massager? When it comes to getting the best massage possible through a portable massage cushion, the Snailax cordless Shiatsu back massager stands out from the rest. If you want something that mimics the real thing–a professional masseuse–this one is the way to go. With 10 nodes, it provides a Shiatsu-style massage that can knead out even the tightest of muscles. If the feeling is too intense, it comes with a pad you can attach onto it so that it’s less rough on you. For a good price, it offers quality and versatility. You can use it on your back, neck or legs and get the added value of heat. The most common complaints people have when they get a massage cushion is that it doesn’t fit their torso height or the massage intensity is too strong. Shiatsu massagers, in particular, are designed to knead your muscles at a high-intensity level, which may not be desirable for people who want a massage just to relax. Shiatsu massagers are designed for people with acute muscle tightness or chronic back pain who need a high amount of pressure to get results. If you decide to go with a Shiatsu massager, try adding a folded towel or blanket as padding against it to lower the intensity. It’s better to add or remove layers of padding until you find what’s most comfortable for you, as some people experience bruising and pain when using a Shiatsu massager directly. Deep tissue massage is not recommended for pregnant women, as it could stimulate contractions. For this reason, women should avoid Shiatsu massagers during pregnancy. There’s no evidence to suggest that vibrating massagers are harmful to pregnant women, but it’s always wise to consult with your prenatal care provider before trying any device. It can be an exciting prospect once you’ve swapped your cash for a brand new massager, however, once you’ve taken it out the box and tried it out, it is possible that your excitement can fade into disappointment. Whether or not a massager works for you can be a bit hit or miss. Many users find it to be too rough and painful and need a heavy blanket between the rollers and their back. Others complain it’s too short and doesn’t reach their upper back height. That’s why it is advisable to try out the chair pad before buying or at least choose a chair pad with a money back guarantee. However, the above list should help point you in the right direction of selecting the right massage cushion for you. Thankfully, many manufacturers provide money-back guarantees so that you can return the massager if you don’t like it. The benefits of massage therapy are manifold, so getting one is well worth a try. You’ll know you’ve found the right one when you feel improvements in your stress levels and are able to work out the kinks in your back and other muscle areas.